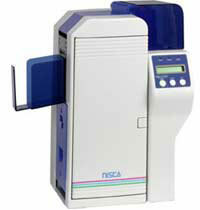 Dependability and speed come in one sturdy package with the NiSCA PR5310, which produces 103 two-sided cards per hour. It is designed to create large numbers of drivers licenses, access control ID badges and other secure cards. Its input and output hoppers hold 100 cards apiece, and the PR5310 supports 20 mil to 50 mil cards, and NiSCA offers several encoding and customization options for additional convenience. Printer with HID ICLASS & HID PROX (READ ONLY). Printer with IC Contact Chip Encoder. Printer with HID ICLASS Encoder (13.56 MHz R/W).